As you walk the main street of Siena you are literally retracing the steps of thousands of pilgrims who travelled the via Francigena, Europe’s main traffic artery for those who were headed to Rome. On this guided tour, we will visit this street, admire its monuments and learn about the way one road helped make Siena one of the most important medieval cities in Europe. The imposing cathedral of Siena has a complex history that extends from the mid 1100s to the early 14th century. Not only does it contain world-famous works of art by greats such as Donatello, Pisano, Michelangelo, Pintoricchio and Beccafumi, but even the floor with its allegorical inlaid scenes is the subject of many books. This tour will introduce you to the Duomo and some of its many wonders. A visit to Santa Maria della Scala, Siena’s historic medieval hospital and museum. The Spedale (“Hospital”) of Santa Maria della Scala was founded to welcome and care for pilgrims who were headed to Rome from northern Europe. One of the first hospitals to be built in all Europe, it is now an artistic and cultural center. Featured prominently on its walls are wonderful 15th century frescoes that detail state of the art medical care in the 1400s and the hospital’s many contributions to Sienese society. Did you know that Siena is an area where water is particularly scarce? In the Middle Ages, between 1200 and 1400, medieval engineers constructed a brilliant and unique underground aqueduct that is still perfectly preserved and functioning today. 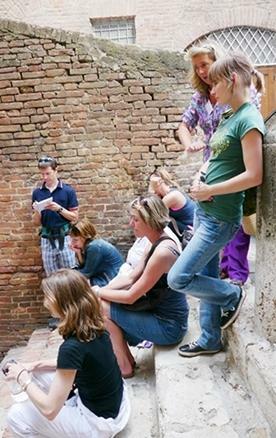 Learn the fascinating history of the fountains of Siena in this guided lecture tour and visit. Do you know which church houses the relics of Saint Catherine? Do you know which church Verdi chose for the debut of his Requiem? Do you know which church houses museum quality works by Pietro Lorenzetti, Matteo di Giovanni, Lippo Memmi and Taddeo di Bartolo while outside there is three-star view of the city? This tour of some of the greatest churches in Siena will inform you!